On August 7, Theodore Wafer was found guilty of second-degree murder for the killing of Renisha McBride. After injuring herself in a late-night car crash, Renisha presumably sought help at Wafer’s house, but instead of providing it he shot her in the face with his modified shotgun. Dearborn Heights, where Wafer lived, is a majority white suburb (as of 2010, 86% of the population was white; shockingly, 100% of the police force is white as well) that borders on majority black Detroit, where Renisha lived (as of 2010, 83% of the population was black). After the verdict was announced, Wafer was remanded into custody and is currently being held at Wayne County Jail. Although the guilty verdict is the best possible outcome, it’s hard to say that justice has been done since Wafer’s conviction cannot bring Renisha back or contribute to abolishing white supremacy, which feeds on the policing and legal apparatuses of the state. If the defense declined to speak explicitly of race, it may be surprising that the prosecution did too. After all, many protesters rightly connected Renisha McBride’s death to the racist shooting of Trayvon Martin by George Zimmerman and argued that in both cases race contributed to the police’s initial decision to believe the killer and choose not to arrest him. According to the McBride family’s attorney, however, neither he nor the family believed the shooting was “racial.” And he went further and criticized the defense for wrongly “injecting race” into the trial by having Wafer describe how his neighborhood was “changing.” In other words, everyone involved understood criminality as a racialized category while rejecting the usefulness or applicability of race for adjudicating the case. No one wanted to talk about race, but everyone was always talking about race. This is the condition of what Eduardo Bonilla-Silva calls colorblind racism, which replaces “race” with a series of other categories, such as “poverty,” “culture,” or “criminality.” “Whereas Jim Crow racism explained blacks’ social standing as the result of their biological and moral inferiority, color-blind racism avoids such facile arguments. Instead, whites rationalize minorities’ contemporary status as the product of market dynamics, naturally occurring phenomena, and blacks’ imputed cultural limitations.” In the legal context, likewise, the discourse of race necessarily appears as a disavowal, as (not) race. But in Wafer’s account the “white flight” narrative takes on a new form. An obvious difference is that Dearborn Heights is not Detroit—it is, rather, the anti-Detroit, one of the suburbs to which Detroit’s white residents moved to escape the black “hordes.” But there is another new aspect in his story as well. It is not white residents in general who began to leave the neighborhood but a specific type of white residents—police officers. In his testimony, Wafer observed that his neighborhood used to be called “Copper Canyon” because many police officers lived there. For years, Detroit had a residency requirement which made it obligatory for city workers, including police, to live within the city’s limits. So they moved as far out as they could get without crossing the line. A quasi-suburb, “Copper Canyon” occupied a zone of official inclusion but affective separation from the city—a relation forged in the perception and rejection of the city to which, in jurisdictional terms, it actually belonged. Yet at the same time Wafer’s narrative suggests that he considered Detroit’s “Copper Canyon” to constitute part of his own neighborhood within the city of Dearborn Heights. Wafer testified that things started to change after the residency law was overturned “in the late 90s.” In 1999, the Michigan legislature passed Public Act 212, which prohibited municipalities from “requiring individuals to reside within certain geographic areas or specified distances or travel times from their place of employment as a condition of employment or promotion.” A little over a decade later, about half the Detroit police force had moved and was residing outside the city. In general terms, this law contributed to accelerating the decline of the city’s population, which fell 28% between 2000 and 2013, when the city declared bankruptcy using population decline (and ineffective policing) as a major part of its rationale. In order to visualize Wafer’s testimony, the defense showed the slide at the top of this post. 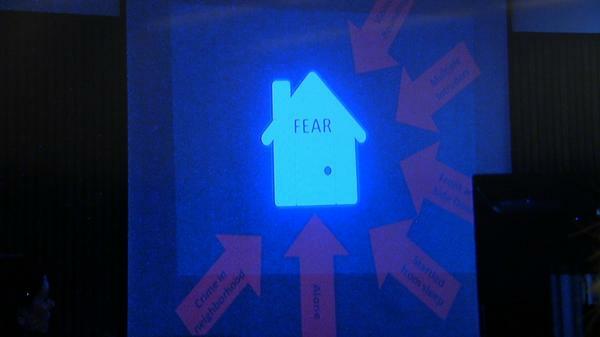 In the center of the image, there is a glowing white icon of a home labeled “FEAR.” Out of the darkness that surrounds it jab arrows from multiple directions, pointed directly at the home. One of the arrows is labeled “Crime in neighborhood,” another “Multiple intruders,” a third “Violent po[ssibilities? ].” Despite the fact that self-defense is presumably based on a threat to a person, there is no body in the image, only property. The image thus encapsulates capitalist white supremacy in an age of colorblind racism—the defense of whiteness embedded in the defense of property, the naturalization of racialized fear, the weaponized language of “castles” under siege, the legitimation of extrajudicial violence. This image is meant both to visualize and to rationalize Wafer’s fear, to make it appear honest and reasonable, and by doing so to neutralize his culpability according to the state’s self-defense law. But honest belief and reasonability, much like criminality, are themselves deeply racialized. What some people—property-owning white people, for example—find reasonable tends to solidify into the naturalized definition of reasonability. Against this purportedly universal understanding, other forms of reasonability appear as irrational or criminal. For some, avoiding, running from, and distrusting the police makes you look like you have something to hide; for many others, it’s the rationality of everyday life under a brutal regime of police occupation. they use the irrational fear of young, black people to promote policing and criminalizing their existence. Kelling and Wilson want to purge the neighborhood of the undesirable — the homeless, the poor, the loud, the young and black — by harassing, abusing and forcibly removing them so often that they either no longer appear in public or get locked in a cage. If Broken Windows aims to purge communities of their “criminal” residents, police exodus offers a fantasy of who should replace them. In fact, it goes beyond fantasy—the city of Detroit recently offered to sell abandoned houses to police officers for as little as $1,000 to encourage them to move back into the city. The white supremacist theory of urban change sketched out in Wafer’s defense, in other words, has been literally transformed into official policy by Detroit’s elected politicians. A city full of cops… But Detroit cannot be repopulated with cops alone—at least we hope not—and in this sense police exodus operates more effectively as a story of decline than a program for revitalization. But it also helps to clarify both the centrality and the white supremacist logic of policing in any vision of a Detroit renaissance, whether or not race is explicitly invoked—and most clearly where it is disavowed. Thanks to Thandisizwe Chimurenga (@idabeewells) and Oralandar Brand-Williams (@oralandar_DN) for livetweeting the trial—this piece could not have been written without your work—and to Alex Vitale (@avitale) for providing resources on police residency requirements.